The first one completed has been previously imaged and reproduced, here are the other two: Hand fabricated copper with partial tinning © Bh. This style is our most called-for request, Rings and Earrings alike – 18ct Yellow Gold with raised Holbein stitch covered with White Enamel and bezel set with a single gem stone (usually a hard coloured one, like a Sapphire – either cabochon or faceted). 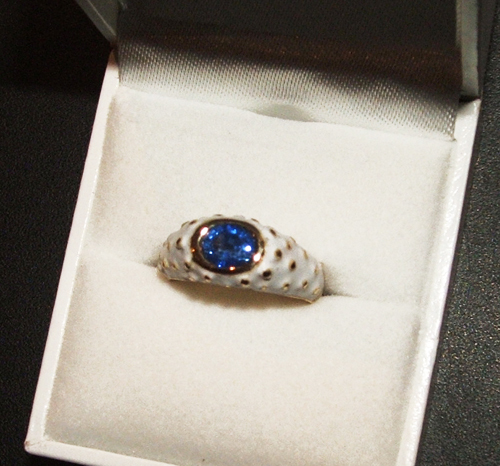 In this instant, Lawrence’s own gem purchased in India (ages ago) with much sentimental attachment. His gift to his lover as her 60th birthday marker. Elizabeth Bates is a long-time friend of Malcolm and a great supporter of Barbara’s work. Heritage house portraits by contemporary Queensland artists: We were commissioned to design and create our response to an Ipswich House in 2008, the working developments have been posted previously on the viewersite blog, here, here and also The Chestnuts: here. It was such a delight to accompany Linda Cooper (one half of our house owners), her two daughters Germaine and Justine and a family member Mark, here from the UK. Allen Cooper was in Tasmania at their other house, working away. 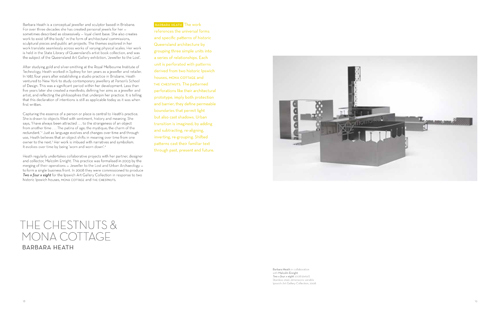 The four catalogue pages devoted to our work; ‘two x four x eight’ are dropped in above and can be downloaded here. We have received very good feedback, are delighted with the outcome and invite everybody to make the journey up to the show (you have a window before November 14 2010). Other artist friends in the show have also reported a genuine interest in the project’s strategy, development and exhibition outcome. We saw Michael Zavros later in the evening but didn’t manage to chat, we did chinwag with Maureen Hansen, Carl Warner, Richard Stringer and Christina Waterson (and partners and assorted kinder). We were sorry we didn’t manage to meet the other artists – it was definately an excuse to do a dinner and musical chairs! Finally, the large, perfect bound catalogue is by our designer mates at ‘designfront’ (Leesa Hickey, Tony Gooley and Angelina Martinez) and well worth the asking price of $40. Michael Beckman and his curatorial staff; Dawn Ross, Jade Williamson + Kate Stewart, Sharon Marsh, Jacina Leong, Ingrid Hedgcock, Tasha Finn, Caitlin Pijpers, Ngaio Parr and Pauline Garner all wrote eloquent and precise essays that fleshed out the house histories and present owner’s attachments. ARTIST TALK (update): Sunday, 31 October 2010 2:00pm for 2:30pm at the Ipswich Art Gallery. Refreshments are served so RSVP is requested <info@ipswichartgallery.qld.gov.au> Bh and mal E will join Christina Waterson & Richard Stringer in front of our own installations to discuss our works. We would love to see you all there? The Artisan invitations (above) are being sent this Thursday, we have supplied maybe 20 names of folk who don’t have emails – everyone else can download their invite here. 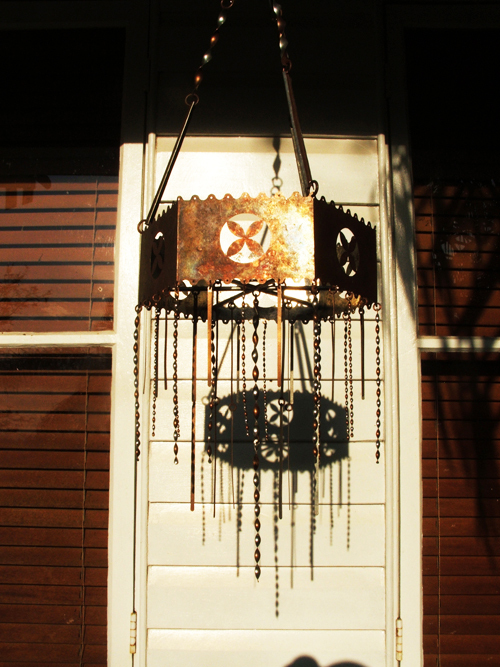 We do look forward to sharing almost a year’s worth of focus and attention on the lost art of the colonial tinsmith. Hope to see you there so make a diary entry today, please? 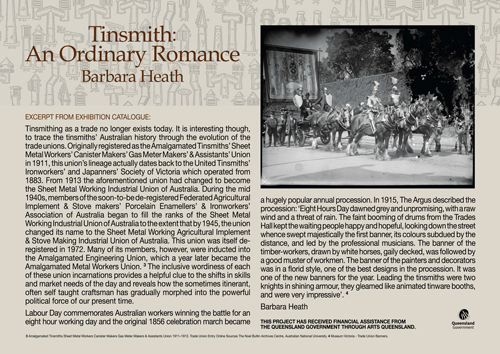 The fascinating and forgotten history of tinsmithing in Queensland, inspired Barbara Heath, a Brisbane-based jeweller and artist, to create a new collection of work. Tin was once as common in our everyday lives as plastic is today. It was just as revolutionary as well, as tin coated steel replaced heavy cast iron cooking utensils with modern lightweight ones and by the end of the 19th century virtually every household utensil was tin. Early Queensland tinsmiths used tinplate, wire, solder and a few simple tools to produce utilitarian items such as downspouts, kettles and canisters. Initially they followed the pioneers to supply the needs of the miners, farmers and settlers as they journeyed to ever more remote areas. By the mid 19th century the growing building trade saw an increase in the number of tinsmiths as well as in the scope of their products. They diversified into fittings, roof guttering, spouting and ridge capping. This work was frequently both ornamental and practical and it contributed to the distinctive character of the local architecture. The craft of tinsmithing has now mostly disappeared. Displaced from their traditional profession by new machines and technologies, tinsmiths turned their skills to the plumbing and roofing trades and their earlier work, once so common, is now hard to find. By the late 1880s even the evocative name of the trade began to fade as tin plate gave way to galvanised iron. 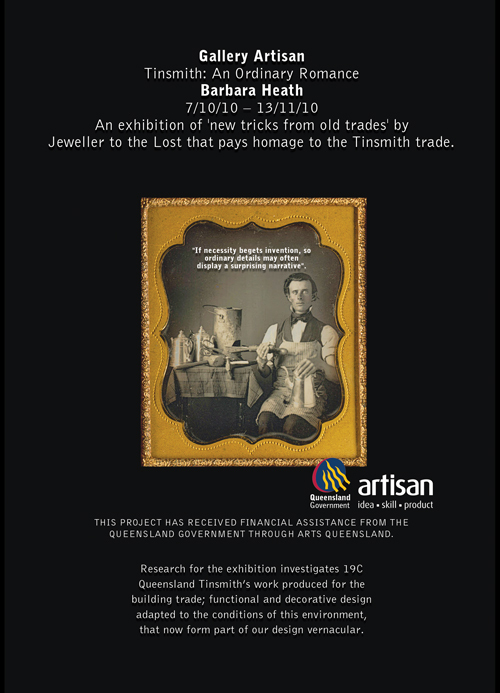 This exhibition includes a collection of old tinwares from several private collections and a selection of the patterns of Graeme Gillespie, one of Brisbanes last working tinsmiths, alongside Barbara Heaths new objects. Some of these such as the candlesticks, rediscover the simple skills of tinsmithing; of bending, folding and tinning. 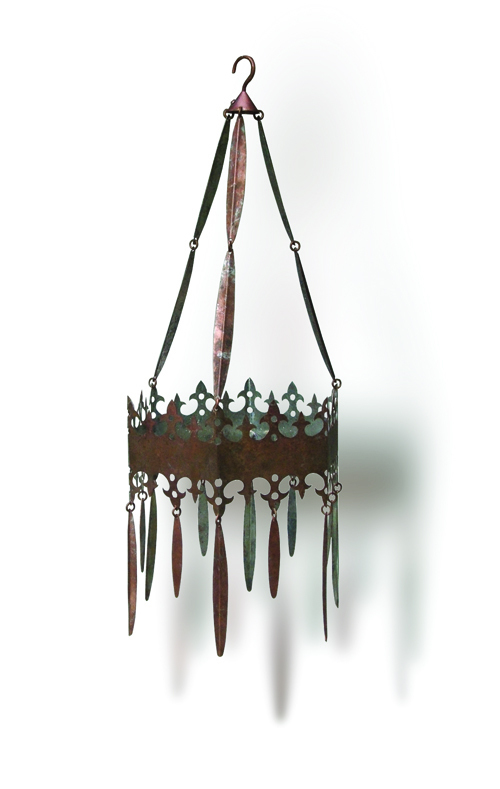 Others, in the spirit of the whimsical tinsmithing that generated charming items such as acroteria architectural ornament for the corners of roof guttering are intended to delight the eye and adorn the home. 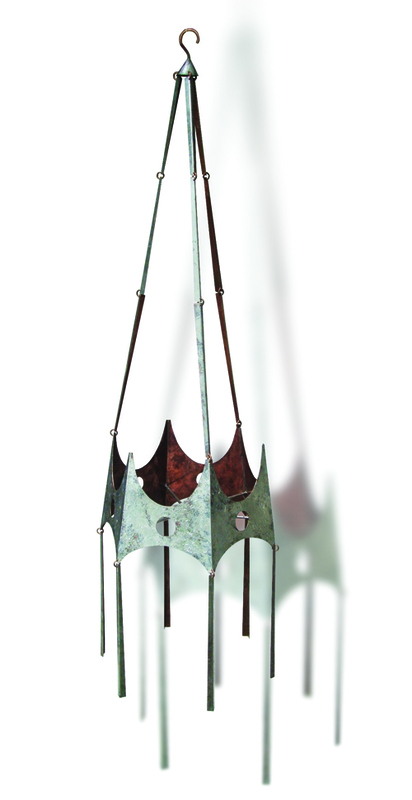 These include Hausgeisters and Hanging Crowns, imaginative protective objects for the home or garden. 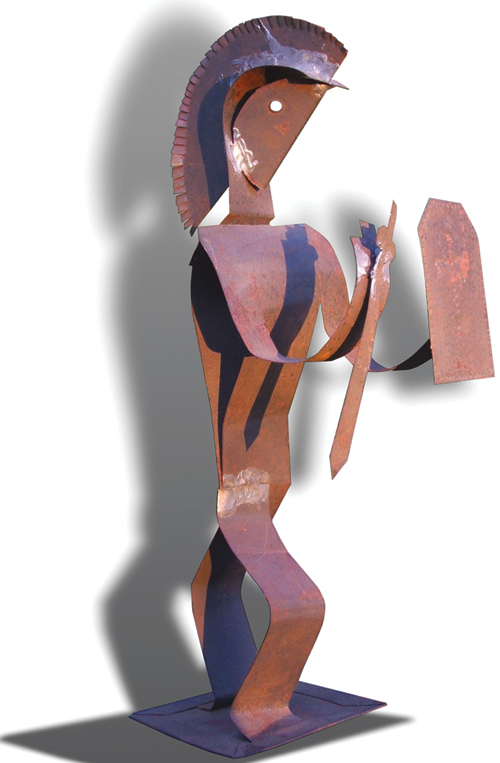 Both are recurring forms in Barbaras exhibition work, but they have taken a new direction in this incarnation as a result of her research into the tinsmithing trade. This exhibition also features new Japanese-inspired rain chains, downpipe substitutes that convert roof run-off into a water feature. 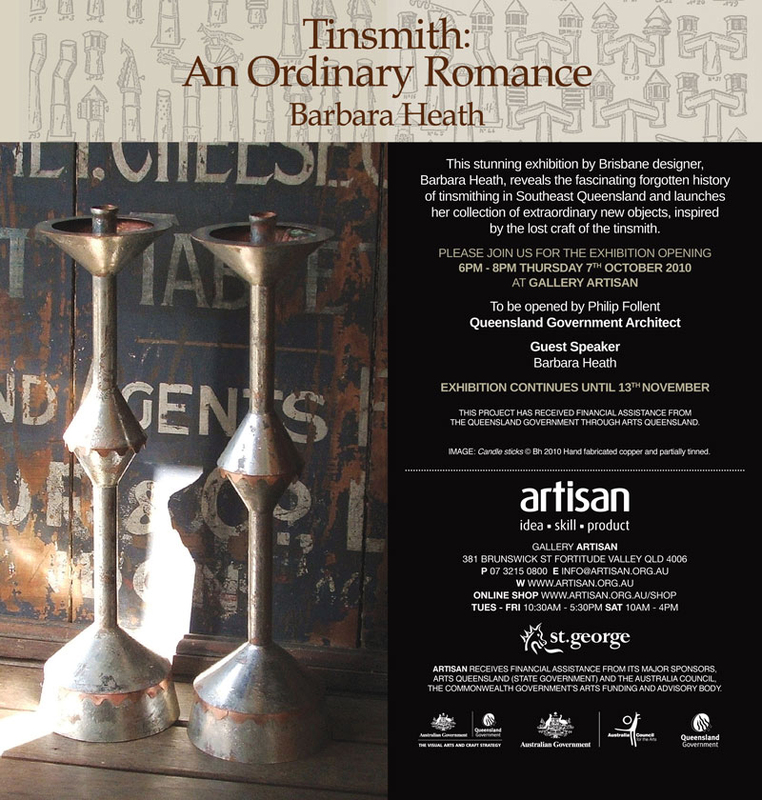 Tinsmith: An Ordinary Romance merges the boundaries of art, craft, design and trade. 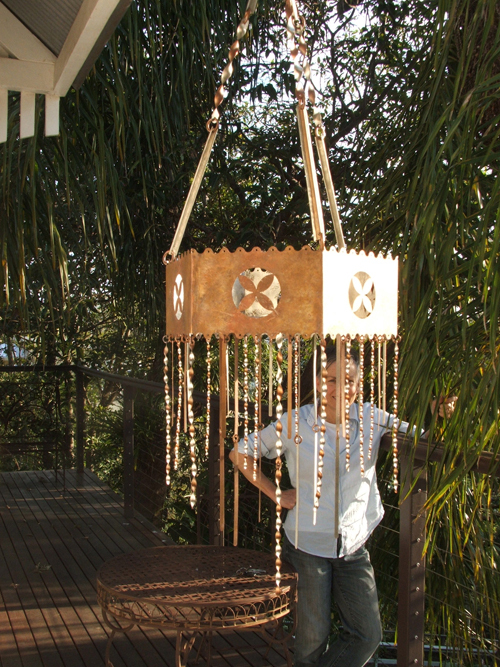 Barbara delves into local history and takes the techniques and mystique of a lost craft and interprets it into contemporary form. 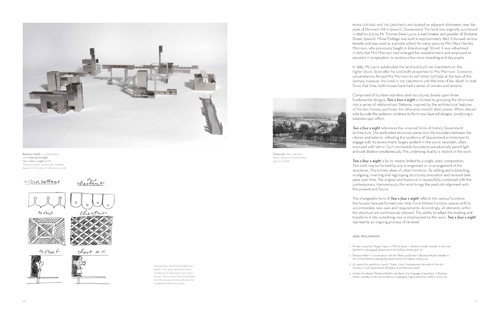 The 16 page catalogue is at the printers, it will be on-sale at Artisan from the opening night of October 7 2010. The small (2Mb) .pdf version can be downloaded here. Researched, designed, photographed and produced in-house at Jeweller to the Lost. Prepress and print by David Darling at D&D Colour. 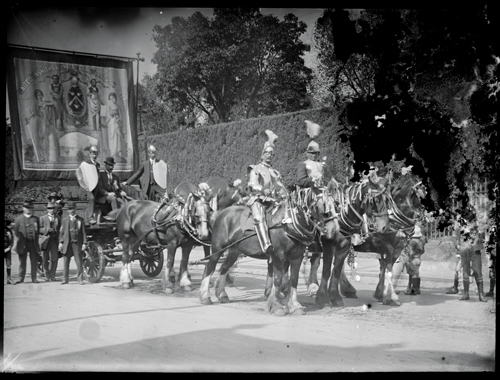 This glass negative pic (below) is now out of copyright but we hold reproduction rights from the State Library of Victoria – United Tinsmiths and Sheet Metal Workers Union members with banner on horse-drawn wagon at Eight Hour Day procession 1918. Shown in the window will be our own naive St George tin figure (below), found years ago in a junk shop scrounge in West End, Brisbane. Alan Coles is our plumber in Ross, Tasmania. He is so English and proper, old-school reliable and (I always forget not to swear in front of him) as he doesn’t abide a sailor’s tale or the floral vernacular! He does have a fascination of all things that fly and unusual clocks and dials. 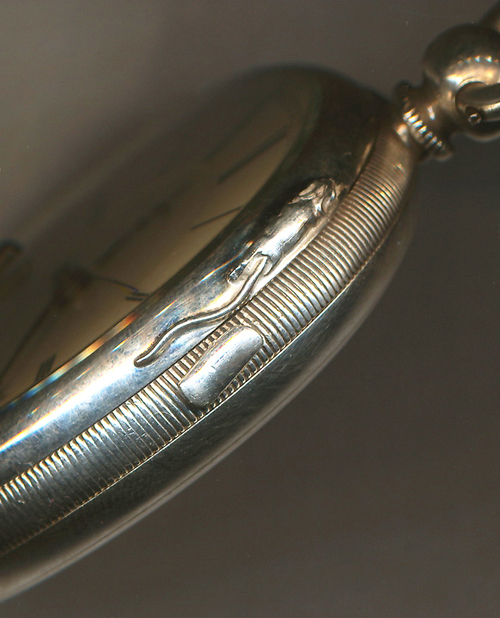 We love the guy – without any warning we received a watch and these instructions: “I want a small mouse carved in silver and I want him running up around the watch case, the movement isn’t working so can you also have a look at it”. The movement has a seconds sweep and a push down button just behind the front case lug for stopping the seconds count. We have to avoid messing with this action and positioned the mouse in front of the lug. Juan-Luis roughly made a silver lump, managed to solder it onto the case with minimum heat and then carved away the silver creating the running mouse form. We obviously removed the movement and glass prior to the mouse make. 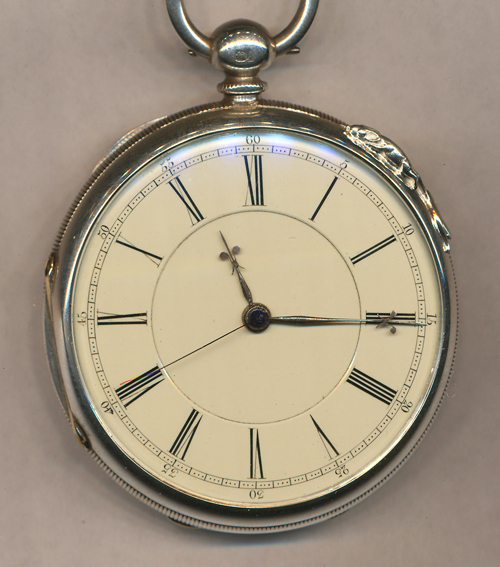 We sent the movement to the Chinese watchmaker – Paul who does complicated fusee repairs for us. I collected the watch today and it will be snail-mailed to Tasmania tomorrow. When discussing the task with Alan over the phone I did hint at the carved mouse of the English furniture maker and yes it was this man he had in mind when commissioning his mouse, only he couldn’t remember his name. Robert Thompson – the mouse man from Kilburn in York, UK has always been a favourite maker of mine, for his stoic arts & crafts style. 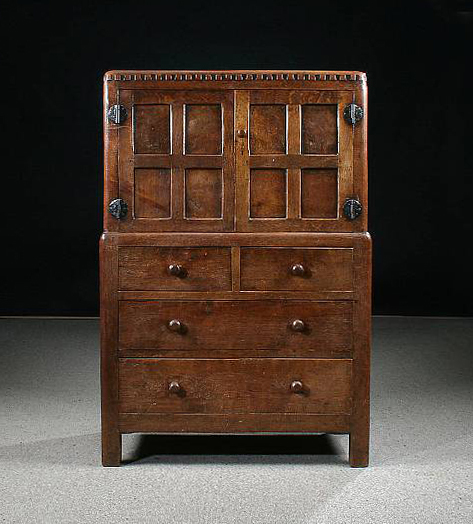 His business is still carried on today, but I always clip his earlier auction shot pieces for my ‘antiques’ folder.